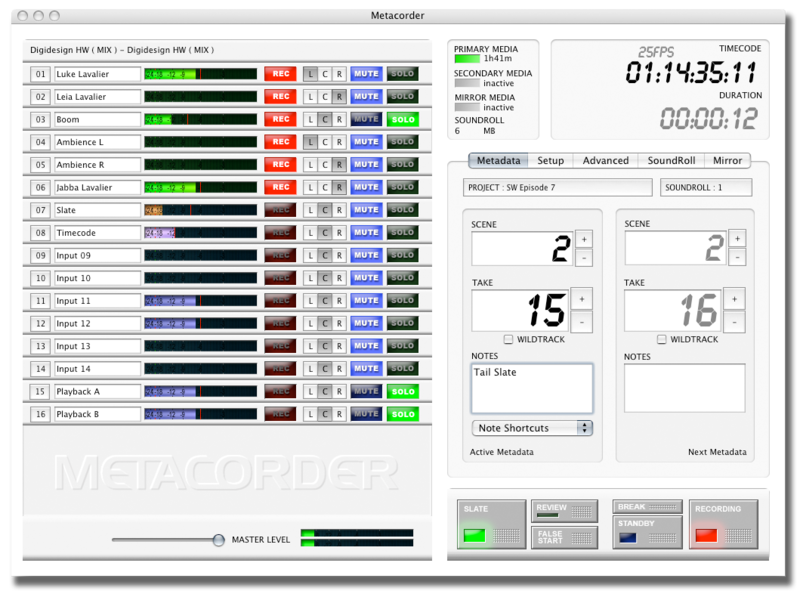 Metacorder is a full-function incredibly powerful field audio recorder which combines macOS and any CoreAudio interface to offer cutting edge functionality at an extremely cost effective system price. If you have ever considered using a laptop for field recording, but were put off by the lack of proper, dedicated software, prepare to be amazed at what Metacorder can do for you. Offering the very latest advances in recording technology such as pre-record ram buffers on all inputs, sample rates up to 192kHz, and up to 64 inputs, Metacorder has equivalent functionality to proprietary hardware systems costing 5 times as much. In 2004 Metacorder became the first professional production sound recorder based on a laptop, redefining the entire industry. It was also the first product to ship using the (now industry standard) iXML protocol developed by Gallery. Since then thousands of critical movies, TV shows and live events have used Metacorder to capture audio sources in zero-failure-option scenarios like big budget movie shoots. The reliable recording engine combined with super-easy entry of rich metadata and automatic management of takes for review and sound log creation have given Metacorder pride of place in thousands of the world's top sound carts as primary, or backup recorder. Works with Any CoreAudio compatible Interface (44.1 kHz - 192kHz, 16 - 24 bit, 2 - 64 Channels, Dante, Ravenna AES67 and more). Any Mac laptop or mac mini which is less than 10 years old. Your own choice of Mic Pre, A-D Convertors. Any Mac compatible Media, internal SSD, USB3, Flash. Primary and secondary media, plus automated backup to CD-R, network volumes, cloud etc. Writes mono/poly/dual poly Broadcast WAVE, or SD2 files. Audio Overload alert tone preference.